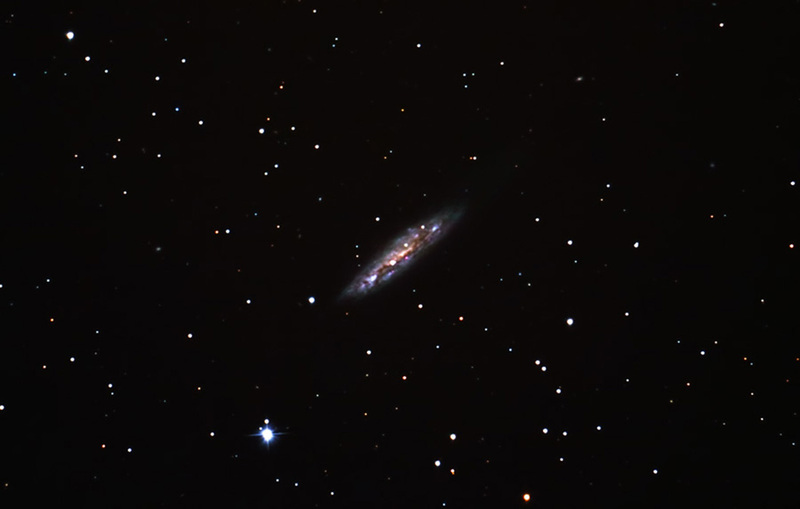 M108 is a barred spiral galaxy that is viewed nearly edge-on from Earth. It is a member of the Ursa Major cluster of galaxies. The disk is obscured by heavy dust and gas. This galaxy was discovered by Pierre Mechain in 1781. However, it was not officially added to the Messier catalog until 1953. Images were focused using Live View. The subframes were converted using Canon Photo Professional and then aligned and combined in ImagesPlus. The final image was adjusted and cropped in Photoshop. Topaz DeNoise was applied to reduce noise.